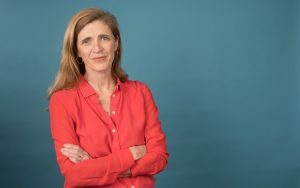 The Academy is pleased to announce that former Ambassador to the United Nations, Samantha Power, has been selected as the recipient of the 2019 Daniel Patrick Moynihan Prize. She will deliver the annual Moynihan Lecture on October 3, 2019, at 4:00pm at the Willard Intercontinental Hotel in Washington, DC. Power served as the 28th U.S. Permanent Representative to the United Nations from 2013 to 2017, where she became the public face of U.S. diplomacy at the UN. She advanced U.S. policies at the UN, including rallying member nations to oppose Russian aggression in Ukraine, negotiated tough sanctions against North Korea, helped to create new international law to dismantle ISIL’s financial networks, and worked to release political prisoners around the world.